Item number Nb3.1352 from the MOA: University of British Columbia. Large carved, dark brown head with pronounced features like hollow cheeks and eyes, pursed lips, elongated slightly hooked nose and one thick double-arched eyebrow over both eyes. 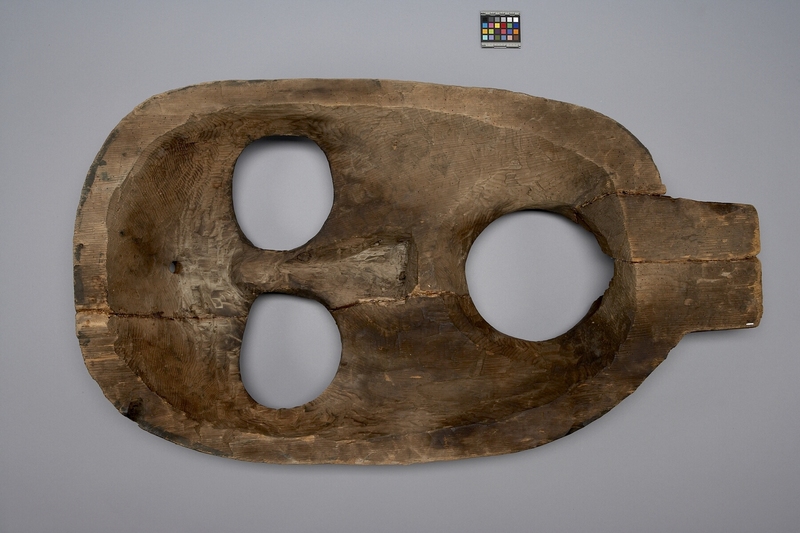 Back hollowed out: two joined pieces form oval tapering to base that has neck-like projection hollowed out in front. Forehead's centre has borehole; nails hammered into head's top; some red pigment on nose and temples; forehead, eyebrow, and nose are textured by small diagonal cuts in surface. 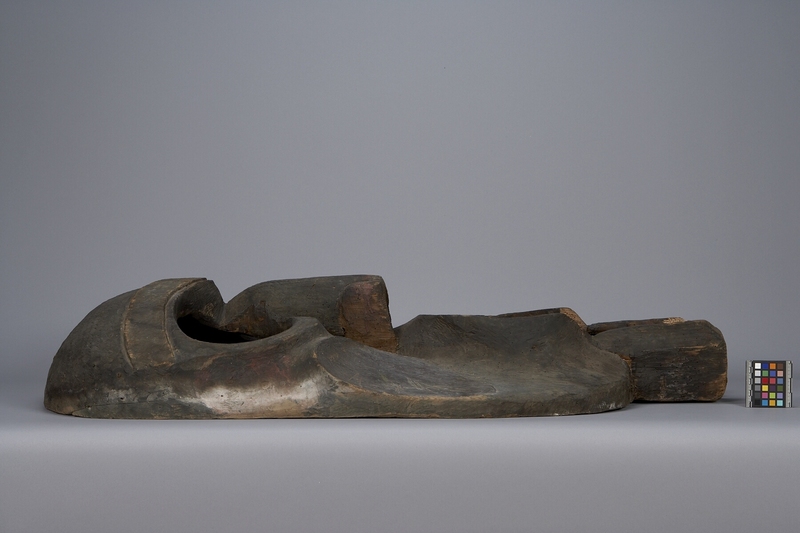 In ceremonials, Tsonoqua, appears as feast dish figure and as masks worn in dances. These are often of giant size. 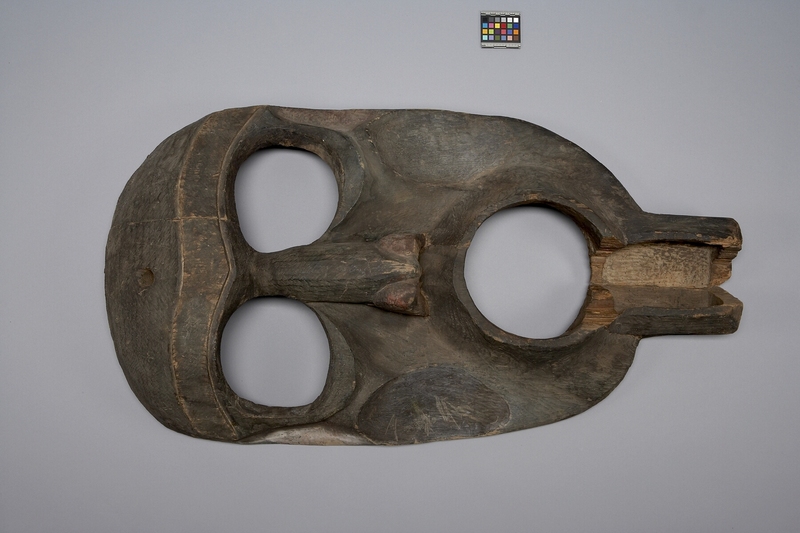 Also as 'gikaml', chief's mask, which is usually of moderate size. Giantess, Tsonoqua, has a character which is threatening; long, bushy, unkempt hair, either slitted eyes or large open sockets, and pursed mouth through which she utters the paralyzing cry 'hu hu'. Also, all black with heavy eyebrows. She is also giver of wealth, power, and good fortune, and is a family crest figure. Another aspect of Tsonoqua was to control the magic 'water of life', a gift she bestowed on a family that wrested her secrets from her. Importance seen in her magical Sisiutl house beams and posts with many filled boxes of treasure within. She is one of a large family of giants who lived in the faraway mountains and woods. A myth tells of the basket she carried on her back in which she collected children, taking them home to eat. The children usually outwitted her, however, because she was slow-moving.